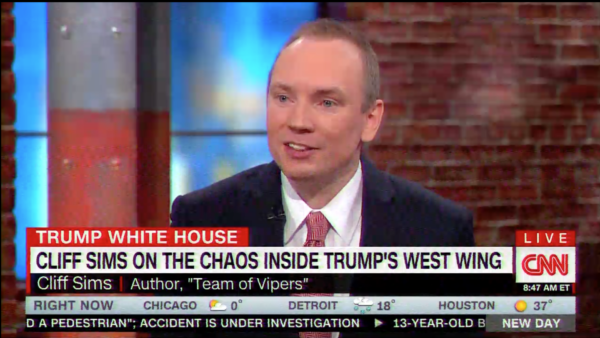 Former White House communication aide and author of "Team of Vipers" Cliff Sims is suing President Donald Trump. When Sims' book dropped last month, Trump attempted to discredit it by claiming that he "hardly knew" the former White House aide. He signed a nondisclosure agreement. The New York Times reported on Monday that Sims is "suing the president in his official capacity, alleging that he used his campaign organization as a "cutout" to improperly seek retribution against former employees and keep them from invoking their First Amendment rights". Last year, former senior adviser Omarosa Manigault Newman claimed in her own tell-all book that the Trump campaign had offered her a $15,000-a-month job in exchange for signing an NDA that would have barred her from disclosing details of her time at the White House. Sims says that he's not sure if he signed an NDA to work in the White House.